Mavis and Sidney John Palmer Scholarship, 2013-2014. This year’s recipients of the Mavis and Sidney John Palmer Scholarship: Sarah Gulick and Erin Finicane. The scholarship was recently set up by Professor Chris Palmer and his wife, Gail Shearer, to honor Chris’s parents. Chris and Gail made a $50,000 donation to SOC to establish an endowment to support the scholarship. Income from the fund is awarded annually, based on merit, to outstanding SOC graduate students with an interest in environmental, natural history, or wildlife filmmaking. 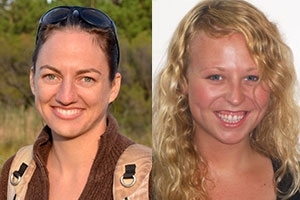 Sarah and Erin, both MFA students, have fellowships through the Center for Environmental Filmmaking with the National Park Service, and are completing their thesis work in partnership with the NPS. 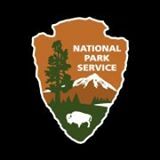 They have developed an award-winning web film series titled America's Wilderness that celebrates the diversity of ecological values and human experiences within wilderness designated areas, the highest level of federal land protection in this country. To see films from the ongoing series, visit youtube.com/NPSWilderness. Sarah is also working with the National Park Service on a video series about natural sound and soundscape protection. She has recently returned from being a Center for Environmental Filmmaking media mentor with Ocean for Life, a NOAA program that engages youth from the USA and the Middle East in cultural exchange and environmental education. She has worked internationally creating a film celebrating the sea turtle conservation efforts of a small village in Belize, and is excited to continue working on projects using sea turtles as ambassadors for our oceans. Sarah is driven to create projects and share stories that inspire positive excitement, engaging local youth and communities in celebrating unique cultures and conservation success stories and role models. Erin specializes in transmedia advocacy and outreach, using digital storytelling as a tool to raise awareness and impact positive social change on issues relating to the environment and social justice. Before her work on the NPS Wilderness series, Erin coordinated an outreach initiative on affordable housing in Washington, D.C., producing a series of educational videos on tenants’ rights, developing bilingual discussion guides, and facilitating public forums around issues relating to affordable housing in the city. She now hopes to apply her expertise in community engagement to environmental and wildlife conservation effort by producing media and developing outreach that encourages audiences to become agents of change in their own communities. Congratulations to Sarah and Erin for earning the Mavis and Sidney John Palmer Scholarships for this year.